Since my last article way back in March so much has happened to prevent me sitting down and focusing my mind on any written work, which is not a report! The only excuse I can come up with is pressure of work .The main project was to get my own garden ready to open for Henfield Gardens in Art which proved a great success for the Village. My garden alone took over a hundred pounds for local charities, not bad for a 20 pence entry charge! Extra work in various parts of the country and general gardening for a local friend has all helped to keep me away from the computer. Who wants to be a ‘mouse potato’ anyway when you could be out in the garden? Knowing the rural areas of Copsale, Nuthurst and Maplehurst quite well, I thought that I would begin this month by giving you the names of some wild flowers which would grow well in the area and that are beneficial to wildlife on the wing. Meadow sweet [Filipendula ulmaria] this delightful wayside plant has creamy white flowers between June and August and is well loved by bees. Purple Loosestrife [Lythrum salicaria ] produces its red/purple flowers in July and August. This plant seems to have made a hit in the garden centres this summer. Marsh Woundwort [Stachys palustris] another red/purple flowered plant. Seeds of the above can be autumn sown in damp areas. This year has been a troublesome one for potatoes. Scab, blight, slugs and wireworm are the most common problems. 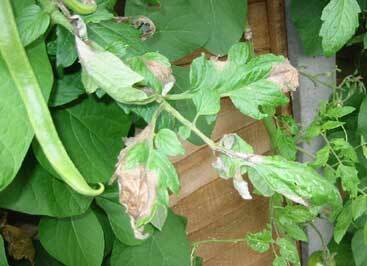 Blight has been particularly bad , infecting tomatoes that grow in the vicinity. [ Tomatoes are in the same family as potatoes along with some of the ornamental Solanums that are becoming popular] Leaves on the potatoes develop grey/brown patches and ,as the spores of this fungal disease are airborne, infestation spreads rapidly. 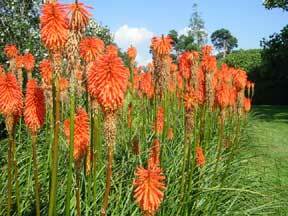 Cut off all infected leaves immediately and lift the tubers before the spores can reach them. Try to keep weeds under control, clear up plant debris and practice good garden hygiene, not only to keep down the slug and snail population but to prevent the spores of fungal diseases for over wintering in the soil. Readers of this ‘spot’ please tell me what it is that is of garden interest to you and pose a few questions in the forum, GO ON, DO IT NOW. !! !